Prices are not dependant on the number of colours in the design; the cost is determined by the size, and number of stitches in the embroidery design. One off Set-Up charge for converting a design to a suitable format embroidery file will be charged if less than 100 garments with embroidery are ordered. Embroidery threads do not come in PMS colours, we will endeavour to match colours to the closest available thread in the ranges from our many suppliers. Prices are calculated depending on the number of stitches in a design, this can only be confirmed once the digitizing / set-up of your design is done. Embroidery prices start from $3.50 for a small design and for a complex chest size logo the price would only increase to around $8.50. Minimum embroidery quantity is 5 garments per design; this can be a mixture of garments as long as the design / colours of the embroidery design required are the same. Our consultants can provide you with an estimate of how many stitches in your design, and advise the approximate embroidery cost per garment, once the set-up has been carried out we can then confirm this charge. Please contact one of our consultants to discuss this further. Free embroidery Set-Up for orders of 100 garments or more, with one standard size embroidery. Standard Size Embroidery approximately 8000 stitches. Additional embroidery on the same garment will attract the Set-Up charge of $60 - $100 depending on the complexity of the design. For orders of less than 100 garments, the Set-Up charge of $60 - $100 will apply depending on the complexity / stitch count of the design. An embroidery stitch out will be provided of the design for approval prior to the addition of embroidery to any garments. Additional sample stitch-outs requested by the customer, for example, to choose/change colours may attract a charge of $10 each. 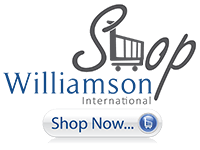 Embroidery files remain the property of Williamson International / The Uniform Company.